Hands down, you're the coolest guy around and you don't even try. Guys want to be you and ladies want to be with you. You have a hot ride, stay up-to-date on all the latest jams and you're low-key fashionable; it's admirable, dude. A cool guy like you should have a cool-guy haircut to, you know, signify to everyone that you're a cool guy, perhaps the coolest guy in the vicinity. Since we're current on all things cool, we suggest you get a high-top. They're amazing! They change the shape of your head from circular to square. We don't know of another hairstyle that's capable of doing that. If you're a little reluctant, we get it, which is why the adult high top fade wig for adults is a great option for you. Test the look before going in for the big chop, but as we said before, a cool guy like you can any look off. 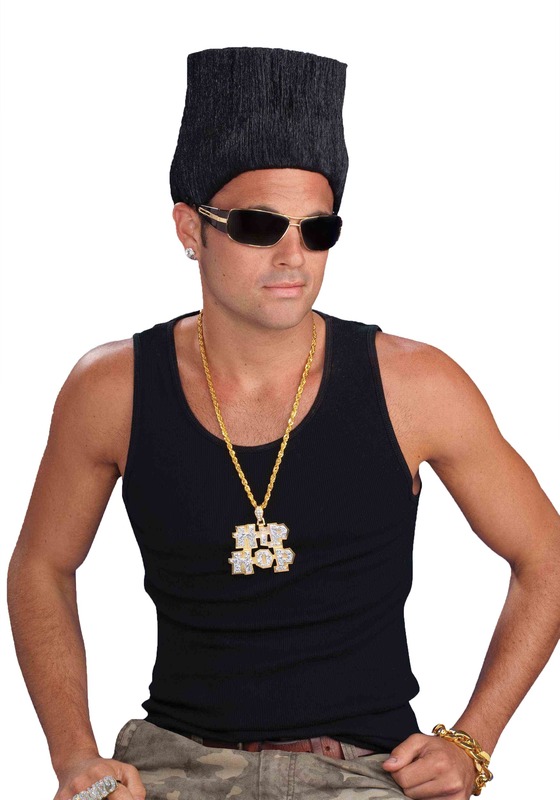 The high top fade wig for adults has an attached mesh cap to keep your real hair concealed. The wig is styled into the popular 90's hairstyle where it's really short on the sides and super long up top. Turn this into a costume by picking up accessories like a fake gold chain and a pair of parachute pants.